This is blatantly a book for a popular audience, not a scholarly work, although it does contain a bibliography of about two and a half pages. Hurwood retells many of the best-known legends and true-crime incidents, with the obvious purpose of intriguing and horrifying the reader. His later book VAMPIRES, WEREWOLVES, AND GHOULS (1968) goes into more detail on legends, superstitions, and the historical origins of those beliefs. It also explores real-life monsters to a greater extent than TERROR BY NIGHT. The entire second half of the later book, “The Monsters Among Us,” deals with criminals guilty of vampire-like, bestial, or ghoulish acts, including Jack the Ripper. Without bibliography or footnotes, we have to take the author’s word for the accuracy of his retellings. 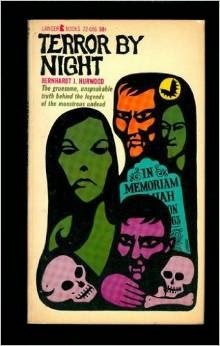 For younger readers, Hurwood wrote VAMPIRES, WEREWOLVES, AND OTHER DEMONS (1972). He’s also the author of many other works on the monstrous and occult, which occupy multiple pages on Amazon, including the edition of TERROR BY NIGHT I have on my shelf (whose cover I’ve copied here). Thanks for the nice write-up, Margaret. I read this in the early 70's when it came out as THE MONSTROUS UNDEAD. I've always been a "monster kid" at heart and I've read countless books, comics, and magazines in the genre, but this Hurwood book still strikes me as so unique in tone and perspective, particularly for the time period it was published. I've just picked up a good copy of the paperback and I intend to re-read it when time allows. Do you have any idea if Hurwood made any alterations between the original version and MONSTROUS UNDEAD?